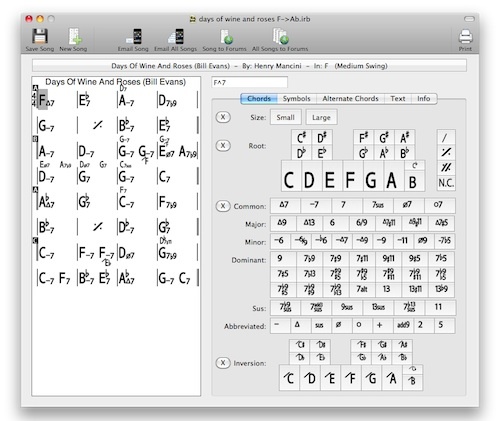 Massimo Biolcati, double bassist from NYC and developper of the iRealBook iPhone-App has updated his iRealBook Editor software for Mac. Even if you don’t own a iPhone (or iPod touch), the iRealBookEditor is a really useful piece of software. You can put together leadsheets very fast, transpose the changes, and print them out or send as PDF. Besides this, Massimo has also launched a Forum – you can now send your tunes to the iRealBook Forum, and discuss and share your transcribed changes with other musicians. You can also find and download a couple of alternate versions and new tunes there, that don’t come with the iPhone app (yet). Massimo has solved this integration very simple, but elegant. This entry was posted in Jazz, New Release and tagged iRealBook, Jazz, RealBook, tunes. Bookmark the permalink.